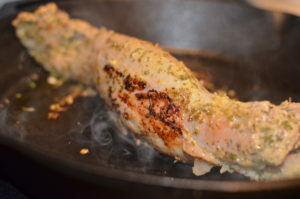 Pork tenderloin is one of my favorite things to make because of the leftovers! 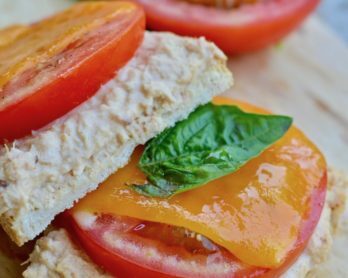 I love making this tenderloin on Monday and then have leftovers for sandwiches, snacking, and to top on salads for the rest of the week! 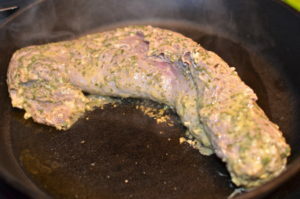 Pork tenderloin is one of those proteins that can be bland so marinating it is key! 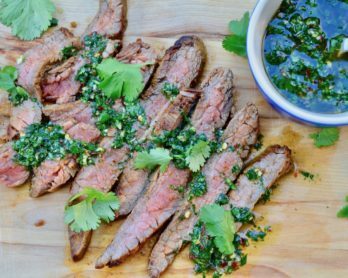 It really takes on whatever flavors it marinates in, which is why this recipe is so delicious! 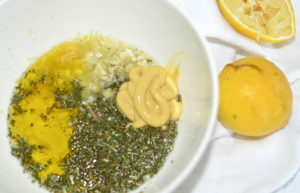 The rosemary and thyme give it a hearty earthy flavor, while the lemon and mustard add a nice acidity. I like to marinate my pork overnight, but a few hours will work fine too! 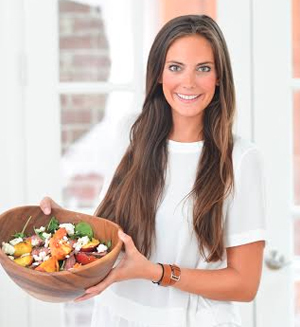 I usually serve the pork with some roasted vegetables and a light salad which make this a super easy weeknight meal! 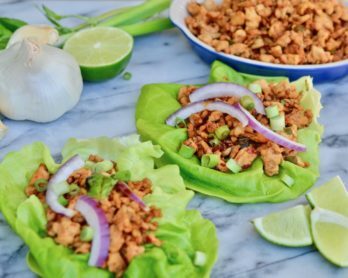 Mix all the ingredients besides the pork in a bowl. 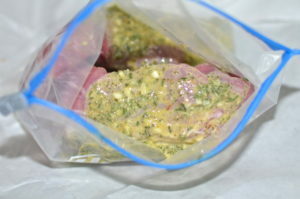 Put the pork in a plastic bag or container and pour the marinade all over the pork. 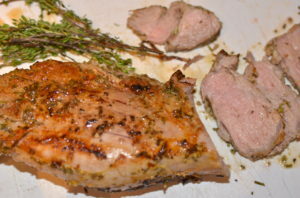 Marinate the pork for at least 2 hours but is best to marinate overnight. 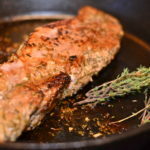 When the pork is done marinating, heat a large cast iron skillet or pan with a drizzle of olive oil. When the oil is hot, put the pork in the pan. Sear the pork on all sides to get a nice crust. You want it dark golden brown on all sides. 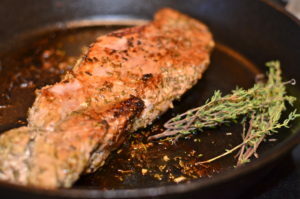 When the pork has been seared on all sides, put it in the oven to finish cooking through. 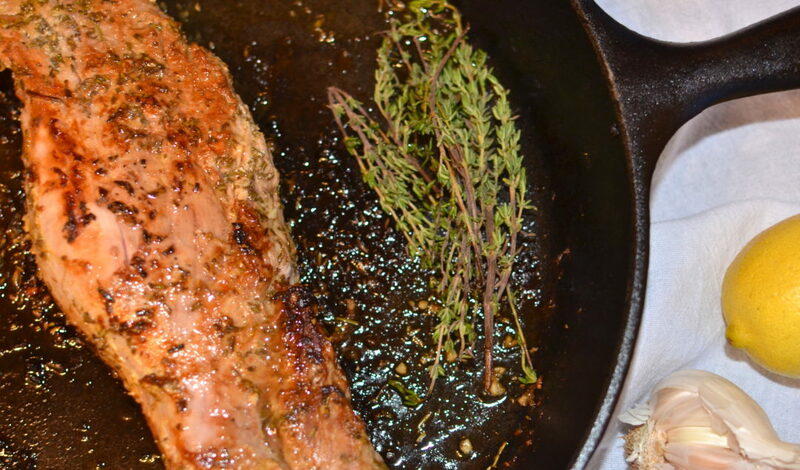 The searing locks in all the juices while the oven keeps the pork tender without burning. Bake the pork for 15 to 18 minutes. You will know the pork is done when the middle of the thickest part registers 140 degrees. Take the pork out of the oven and cover it with foil. Let it rest for 10 minutes before slicing. Slice the pork and enjoy! 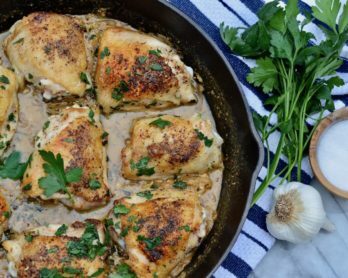 I like to serve mine with mashed potatoes or creamed spinach! Baked Potato Soup with all the goods!